Humane Education: Do They Have a Choice? People are often surprised to hear that the Detroit Zoological Society (DZS) does not include animals in any of our education programs – either on grounds or at community or school events. This is because programs like this – no matter how well orchestrated – can be stressful for exotic animals and can negatively impact their well-being. As a leader in animal welfare and the home of the Center for Zoo Animal Welfare and Ethics, the well-being of the animals is at the core of every decision we make. Consider what it might be like for an animal to take part in a program with many excited children and adults nearby. Animals that are forced to be in programs often have to be physically restrained or manipulated and aren’t given a choice to opt out. The ability of an animal to make choices and to have an impact on his or her own life are fundamentally important to good welfare. As soon as the animal is handled, whether it is to put on a harness or to otherwise physically restrain him or her, any choice to participate is removed and the animal can either comply or resist, neither of which are positive choices. Additionally, regular handling of animals can actually result in a condition called learned helplessness. As the animals learn that they cannot avoid being restrained, carried around and touched, they simply stop reacting. This isn’t a sign of them being comfortable, but instead, that they have given up. Animals used in such programs are often housed in smaller, less complex spaces and may have to be transported between venues for programs. These activities certainly impact the welfare of the individuals in a negative way. Additionally, the normal activity patterns of the animals are often disrupted, as performances are not scheduled based on their circadian rhythms (the natural daily cycles we experience that affect our physiology and behavior), and for some, such as nocturnal animals, these disruptions can have an even more drastic effect. There are many ways in which humans and animals can interact, sometimes without any contact and sometimes more directly. Several of the animal habitats at the Detroit Zoo have been designed in such a way that visitors can be immersed in the experience without actually coming into contact with animals – this includes the Australian Outback Adventure, the Polk Penguin Conservation Center, the Polar Passage in the Arctic Ring of Life, the Butterfly Garden and the prairie dog habitat. We also offer two types of experiences that allow guests to directly interact with individual animals: the Giraffe Encounter and Mingle with the Macaronis. 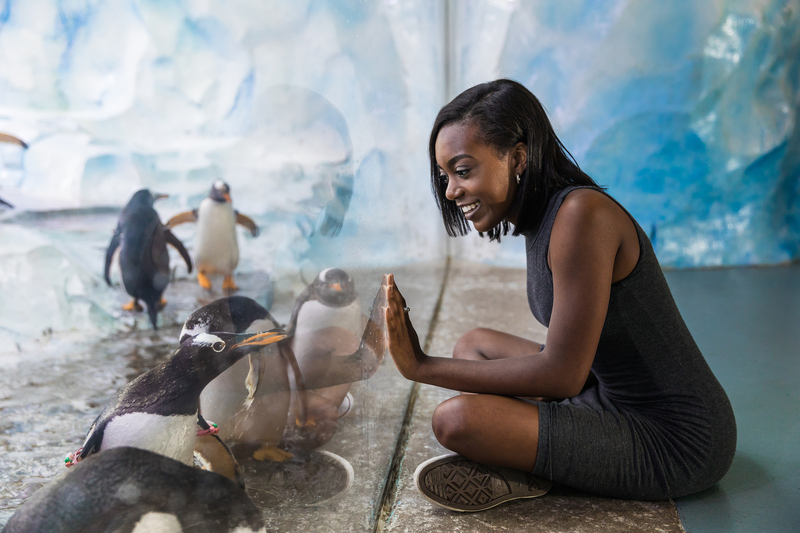 Visitors at the Detroit Zoo have the opportunity to interact with animals in certain circumstances where each animal may choose whether to participate or not. A very important distinction between these experiences and performance-type programs is that, at the Detroit Zoo, each animal has the choice to participate or not. This means that the animals have the opportunity to choose if they want to interact – and there are no negative consequences if they decline to participate – and they can control the amount of interaction and length of the encounter, with the option to leave at any time. Choice and control are critical to good welfare, in humans and non-humans alike. Holding and presenting exotic animals like this also sends the message that we can do as we wish with these animals for our entertainment. This is a message we do not want to send. Promoting reverence and respect for all animals is important – for human and nonhuman species alike – and is an essential component of our mission. In addition, handling exotic animals and allowing others to interact with them may lead people to want one of their own. The experience could mislead people into thinking that exotic animals make good pets or companions. What does a day in the life of this animal look like? What happens to the animal when he/she isn’t being shown? Where did this animal come from originally? How does he/she live? What does he/she do? What is the lifetime care plan for this animal? What is his/her ability to choose? Is the animal participating because he/she wants to? What does the world look like from the animal’s perspective? Try to imagine the experience through their eyes, ears and nose. Choosing not to participate in events or programs that force exotic animals to perform and interact with humans sends a powerful message. The DZS’s foundation of animal welfare and humane education ensures that we provide unique learning experiences without compromising the well-being of animals. – Dr. Stephanie Allard is the director of animal welfare for the Detroit Zoological Society and oversees the Center for Zoo Animal Welfare and Ethics. Lisa Forzley is the curator of humane education for the Detroit Zoological Society and oversees the Berman Academy for Humane Education. Your entire article is enlightening, but this line in particular, “This isn’t a sign of them being comfortable, but instead, that they have given up” is an eye-opener.